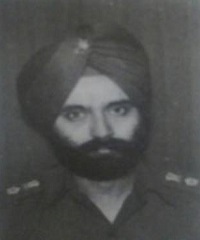 Lieutenant Colonel Abjit Singh Sekhon hailed from Faridkot in Punjab. Son of Shri S Gurdial Singh Sekhon and Smt Kamaljit Kaur Sekhon, Lt Col Abjit Singh was born on 28 Jan 1949. He was commissioned into the Madras Regiment, an infantry regiment known for its fearless soldiers and numerous battle exploits. He served in various operational areas along with his unit, 7 Madras and took over as Commanding Officer of the unit in 1988. His unit became part of the IPKF and joined the operations in Sri Lanka in 1987-88. After the induction of Indian forces in Aug 1987, as part of Indo-Sri Lanka accord signed on 29 July 1987, the militants were supposed to surrender but the dreaded LTTE backed out and unleashed war on Indian forces. Initially, only 54 division of the Army was inducted but the escalation of the operations brought three more divisions 3, 4 and 57 into the conflict. By April 1988, Indian forces had undertaken numerous operations against LTTE but the war was far from over. During 1988 Lt Col Abjit Singh Sekhon was the Commanding Officer of 7 Madras and was deployed in Sri Lanka as a part of the Indian Peace Keeping Force. On 13 April 1988, the security forces received information about the presence of some hard-core militants at a place called Vannerikulam falling under the area of responsibility of 7 Madras. The unit led by its CO, Lt Col Abjit Singh launched the operation against the militants following a sparsely used tract to maintain the element of surprise. The assault team reached his target area undetected and completely surprised the militants. During this action, Lt Col Abjit Singh who was guiding the column killed two hard-core militants, one of whom was later found to be the Area Commander. Again on 21 April 1988, when information was received about the presence of 10 to 14 militants in village Urithirapuram, Lt Col Abjit Singh along with his two platoons, personally led the operation against the militants. During the operation, his troops came under intense fire from the heavily armed militants but Lt Col Abjit Singh deployed his troops tactically and repulsed the attack. He personally shot dead one militant and wounded another. However, during the exchange of fire Lt Col Abjit Singh got hit by bullets in the chest and was martyred. Lt Col Abjit Singh displayed grit, determination, and resoluteness of a very high order and led from the front like a true military leader. Lt Col Abjit Singh Sekhon was given the gallantry award, “Vir Chakra” for his outstanding courage, unwavering leadership and supreme sacrifice. Lieutenant Colonel Abjit Singh Sekhon, Commanding Officer 7 Madras, was deployed in Sri Lanka as a part of the Indian Peace Keeping Force. On 13 April 1988, he received information about the location of an arms cache at a place called Vannerikulam as also the presence of some hard-core militants. He exercised imagination and calculated risk and approached the target areas in vehicles along a hitherto unmapped and sparsely used tract. He reached his target areas undetected and completely surprised the militants. In this action, Lieutenant Colonel Sekhon who was guiding the column killed two hard-core militants one of whom was found to be the Area Leader. Again on 21 April 1988, when information was received about the presence of 10 to 14 militants in village Urithirapuram, he gathered two platoons and along with another officer, personally led the column to the site of the militants. The party came under intense fire from the militants. He jumped out of his vehicle and despite the intense militant fire, organized his party and returned the fire. He personally shot dead one militant and wounded another. It was at this stage of encounter that Lieutenant Colonel Sekhon was hit by a militant’s bullet through the chest and died on the spot. Throughout the operation, Lieutenant Colonel Abjit Singh Sekhon displayed gallantry and valour in the face of militants and made the supreme sacrifice. A “Chowk” in his native town Faridkot in Punjab has been named “Shaheed Lt Col Abjit Singh Sekhon Chowk” in his honour.